Outreach Teen and Family Services has office hours on Mondays through April at the Bethel Park Municipal Building. 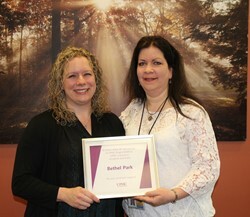 The Bethel Park School District was recognized for its participation in and support of Project SEARCH. April is World Autism Month. Show your support of those with autism by wearing blue on Tuesday, April 2! 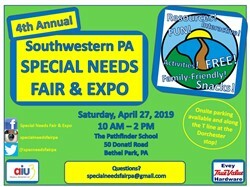 A FREE Special Needs Fair and Expo will be held on Saturday, April 27 from 10 AM to 2 PM at Pathfinder School! Join us! The Pennsylvania Department of Education recently sent the District a letter, commending the District for its efforts to be in compliance for Gifted Education. Please click here to find out how you can request a Special Education Student Evaluation for your child. Please click here to see some important resources for parents. The Allegheny County Department of Emergency Services has developed a Special Needs Registry to provide information about residents who have special needs that would be helpful for emergency responders to know when responding to a home. Approved by the PA Department of Education 5-20-16. This plan is in effect through 6-30-19.